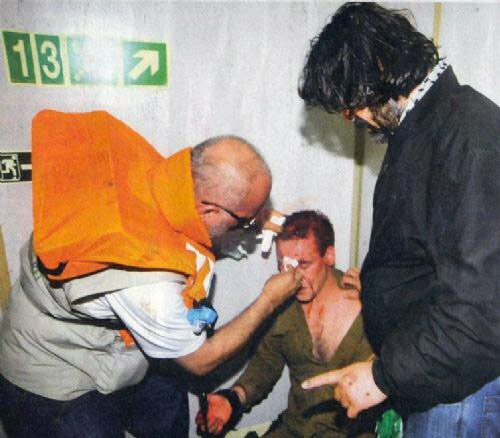 – In contrast to the Israeli characterization of flotilla participants as jihadist thugs, pictures released by Turkish newspaper Hürriyet show activists actually protecting and aiding injured Israeli Navy commandos. (H/T to Ali Abunimah for the link). After spotting the warships at a distance, (at roughly 11pm) the organisers called for passengers to wear their life vests and remain indoors as they monitored the situation. The naval warships together with helicopters remained at a distance for several hours. At 2am local time the organisers informed me that they had re-routed the ship, as far away from Israel as possible, as deep into international waters as they could. They did not want a confrontation with the Israeli military, at least not by night. Just after 4am local time, the Israeli military attacked the ship, in international waters. It was an unprovoked attack. Tear gas was used, sound grenades were launched, and rubber coated steel bullets were fired from almost every direction. Dozens of speed boats carrying about 15-20 masked Israeli soldiers, armed to the teeth surrounded the Mavi Marmara which was carrying 600 or so unarmed civilians. Two helicopters at a time hovered above the vessel. Commandos on board the choppers joined the firing, using live ammunition, before any of the soldiers had descended onto the ship. Two unarmed civilians were killed just metres away from me. Dozens of unarmed civilians were injured right before my eyes. One Israeli soldier, armed with a large automatic gun and a side pistol, was overpowered by several passengers. They disarmed him. They did not use his weapons or fire them; instead they threw his weapons over board and into the sea. After what seemed at the time as roughly 30 minutes, passengers on board the ship raised a white flag. The Israeli army continued to fire live ammunition. The ships organisers made a loud speaker announcement saying they have surrendered the ship. The Israeli army continued to fire live ammunition. – Finally, click above for a deeply disturbing clip of journalist Max Blumenthal interviewing participants at a recent Israeli rally in front of the Turkish embassy. I’m not sure what made me sadder: the callous celebration of an incident that led to the deaths of nine civilians or the “us against the world” siege mentality expressed by so many Israelis on the street. This entry was posted in Gaza, Human Rights, Israel, Nonviolence, Palestine on June 8, 2010 by Rabbi Brant Rosen. I’m not sure what made me sadder: the callous celebration of an incident that led to the deaths of nine civilians or the “us against the world” siege mentality expressed by so many Israelis on the street. Indeed, as they say perception is what part of reality? I feel strangely reminded of the Gleiwitz Incident. These are very, very worrying developments! Did Reuters Crop a Photo to Remove a Peace Activist’s Weapon? Thank you for posting the clip about the demonstration. I recommend all Jewish “progressives” outside Israel view it in order to understand the sea-change that has occurred in public opinion in Israel. It is important to note that all, or almost all the people shown at the demonstration were secular and included people who identified themselves as supporters of the “Left”. This is a major change from the time of the Oslo Agreements when the big terrorist attacks (suicide bombings) began. At that time, those who protested were largely Orthodox/religious. It seems that it has finally sunk into the Israeli public’s mind, particularly those who supported the Oslo fiasco and the destruction of Gush Katif, that political and territorial concessions simply encourage the most radical Arab and Muslim forces and does not bring peace any closer. Most of the Israel public was prepared to accept the so-called “2-state solution” during the height of the “peace process” in the 1990’s but then several things happened. First, Arafat turned down Barak’s offer of an independent Palestinian state at Camp David/Taba in 1999/2000 (please don’t respond that Arafat was “justified” in turning it down, that is not the point, the point is how the Israeli public perceived the situation). This was then followed by Arafat’s bloody suicide bomber war which killed or wounded thousands of Israelis (one who was badly wounded 7 years ago died from his wounds two days ago). This led Sharon to say that Arafat would not agree to a peace treaty with Israel, so he (Sharon) would give them a state unilaterally, which would presumably get the US and Europe off Israel’s back so he began by destroying Gush Katif and then announcing shortly before he collapsed that the intended to withdraw unilaterally from the rest of Judea/Samaria. The Gaza withdrawal then led to HAMAS taking over which in its wake led to TWO wars (Lebanon and “Cast Lead” in Gaza) with considerable casualties on both sides. So the Israeli population sees that unilateral withdrawals don’t work and the Arabs won’t agree to a peace agreement on terms any Israeli gov’t can accept. Now, Israel is condemned for trying to keep weaponry away from HAMAS in Gaza (there is NO “humanitarian crisis” there) and is blasted by “world opinion” for using force to do this as well. In addition, a Muslim state with which has had good military and trade relations with Israel now ends up cursing Israel out and allying itself with Iran and its hinted genocidal intentions with Israel. So why should Israel give up more to the Arabs if “peace” is going to be so fragile? So there you have it….Israelis overwhelmingly support the gov’ts position on Gaza and on negotiations with the Palestinians and realize that unrepicrocated concessions are folly. I realize the “progressives” are apoplectic about this and are in despair. Their only hope is to do like Blumenthal is doing and try to show that Israelis are repulsive people and that “progressive Jews” should not support them. With Israel united, NO ONE can force us to do what goes against our interests. Instead of this pathetic attempt to try to rally ‘progressive’ opinion against Israel, I suggest “progressives” start talking to the Arab/Muslim side and point out to them that their radicalization, use of provocation tactics like the flotilla and use of antisemitic propaganda is not going to get them anywhere. Either they show a GENUINE approach to peace with Israel (which, as the fellow in the clip said) Israelis have been willing to accept, or the current standoff will continue. The Arabs need peaceful relations with Israel more than Israel does, because Israel has grown and prospered for over 6 decades without peace, whereas the Arabs have languished and even gone backwards. The Arabs side is the address for peace. You are completely missing the broader picture. It is finally dawning on the US military and political establishment that the current extent of its support of Israel may not be in the US best interests. At the same time, general US public opinion is becoming more isolationist as it worries about its own fundamentals. Israel has lost that “plucky underdog” image; increasingly US public opinion sees it as an undemocratic, unimportant and expensive partner. The BDS movement is slowly building steam, even here, because its an easy stand. The anti-semitism charge has been used so indiscriminately, so often, that its lost its sting. The UN & the IAEA are sniffing around the issue of nukes, which puts Israel in the same public relations bucket as North Korea, Pakistan and Iran. “Arabs” dont need peaceful relations with Israel because the Palestinian issue is a convenient vent for internal unrest. Israel’s incursion into the Lebanon exposed Israels outdated military capability. The attack on Gaza showed it learned nothing. The image of Israeli military invincibility is long gone. Israeli public opinion is by no means unified around the idea that Israel should or even CAN tough it out. It’s not even unified around your version of recent history. Arafat, Sharon, Camp David, Oslo – all irrelevant. The world is changing. Slowly, for sure, but history shows the pace can pick up all of a sudden. I guess you’re counting on the US to recognize a Palestinian state next year, and then lay-off Israel. You may be right, but you’re gambling that the US will “lay-off” rather than “back-off”. You will note his sequence of events suggests the live fire and killing of two people before the soldiers landed on the decks. If Israel was acting proper then release all military footage of the operation. From start to finish. Not edited pieces. Secondly return all footage stolen from journalists and passengers on board the ship. The onus is on Israel to prove beyond reasonable doubt the killings were lawful. Sadly, Israel is not showing a desire for there to be an independent adjudication on the legality of the killings. The actions of the so called peace activists have done nothing to forward the cause of peace. Their actions were irresponsible provocations that led to violence and death. Peace activists can get involved in many meaningful activities to further peace and coexistence. This is not an example. The innocent on this boat were taken advantage of by those who were not interested in providing aid to the population of Gaza, but rather to challenge Israel’s right to blockade an armed territory whose rulership seeks its destruction. Peace is further away as a result of this provocative performance of seafaring fools. The most important act for peace is standing firmly by Israel’s right to defend herself and affirming an uncompromising insistence on Israel’s right to exist as the Jewish State. The more international and unified such a position is, the closer we will be to a time when the Arab world and Palestinians will accept a future with Israel, as opposed to squandering their future on a vision of Israel destroyed. Are you saying Huwaida Arraf (twice nominated for a Nobel Peace Prize) is not a peace activist? Or are you saying Adam Shapiro a member of Seeds of Peace, cofounder (with Huwaida and others) of the International Solidarity Movement? Or are you saying Greta Berlin is not a peace activist? Or the numerous parliamentarians, doctors and lawyers that participated as part of international civil society in highlighting the 3 year closure of Gaza? This is Huwaida in 2008. This is what she means when she says she puts her body on the line: Gandhi and Martin Luther King Jr are great inspirations for people like Huwaida, Adam and Greta and the numerous other participants on the flotilla. Please don’t vilify people in the broadbrushed approach you have just presented. Names are helpful, because then we have something to work with. Otherwise the information you are sharing has limited value, and is hurtful and offensive to the good name of these organisers. But let us not be distracted by this too much the bigger question is how is Israel’s security increased by banning chocolate, jam and notebooks? And why did Israel fabricate the audio tapes between Israeli navy and flotilla members? And then perpetuate the lie in their ‘unedited’ version after getting caught out. The rubbish about Auschwitz and 9/11 were clearly inserted. This was not even a good fake. This action of attempting to break Israel’s blockade did nothing for peace. It created greater distance between Israelis, Palestinians and the Arab world, and it led to loss of life. The blockade is legitimate and attempts to break it are not. If you and the activists you honor are really interested in peace, then I would hope you would be working to break Hamas and engage with the Palestinians to bring them to accept a future along side a Jewish State, rather than a future dream of a destroyed Israel. This is the hard work, and this is the work of peace. The vast majority of Israelis already openly accept the notion of a Palestinian state, but they are unlikely to make moves towards that vision until it is clear that the acceptance is reciprocated. How many people died, were assaulted or threatened through the nonviolence action of people like Martin Luther King Jr and Gandhi? Nonviolence challenges the status quo. It is intentionally confrontational in nature. It confronts the violence that holds one people below another and says no more. It says no more shall people kneel their head to an oppressor. It says no more shall another dictate what food I am entitle to have, where I can go and where I can live. Nonviolence actions have involved black students sitting in white only counters in the US, it has involved indigenous students going to swimming pools in Australia when indigenous Australians were barred because of their colour. Nonviolence provokes anger from those on the side of the oppressor, those who want to maintain the status quo. But that is not an excuse not to do the action. People of good will must stand together wherever there is injustice be that directed by Hamas, Fatah, the state of Israel, China, North Korea, Iran Egypt, or our own governments. Mr Gershon, Israel’s closure of Gaza is pure madness. Trapping a population only fuels radicalism. The longer Israel pursues this nonsense the worse it will be for everybody. I am saddened you have not read Gisha’s report or spent time understanding the arguments by them and countless others of the senseless strategy of near total closure. I have produce a blog on Israel’s tampering and fabrication of evidence to vilify the Gaza flotilla participants. As I point out in the blog, Israel’s tampering and fabrication of evidence is so bad that it only adds support for the justified international concern that Israel is behaving as a rogue state with no sense of fairness and the rule of law. Israel is fastly becoming what it says it stands against. Mr Gershon, I specifically travelled to the States in 2000 and 2001 to encourage Palestinians that violent resistance was counter productive. Since the Quartet’s Road Map West Bank Palestinians have pursued a combination of nonviolent resistance as well as a return to throwing stones. (ie a return to the David and Goliath struggle as evident in the first intifada – where the Palestinians had stones and the Israelis had the latest weaponry). This strategy has been so successful in Billin that Israel has to arrest the leaders. As the Goldstone Report notes, Hamas, acceptance or direction of rocket attacks on Isrel is a war crime. That said Israel as the militarily and economically stronger power needs to move faster in helping Palestinians to achieve their legitimate right to self-determination. Israel has a state. Palestinians have occupation. Let us work collectively towards providing security for both Israelis and Palestinians; a home for both and a sense of meaning, purpose and identity.